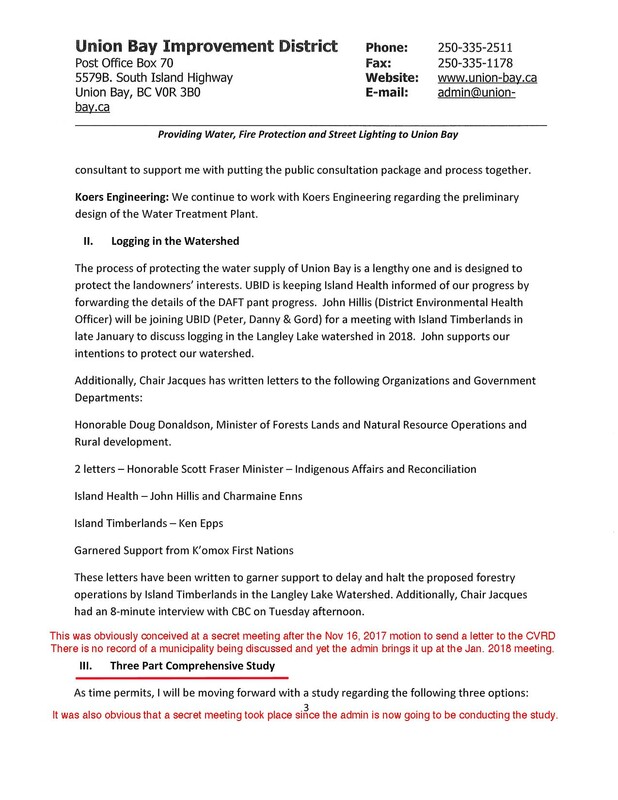 Current UBID board passed a motion to conduct their own study – will not contact CVRD for independent study. 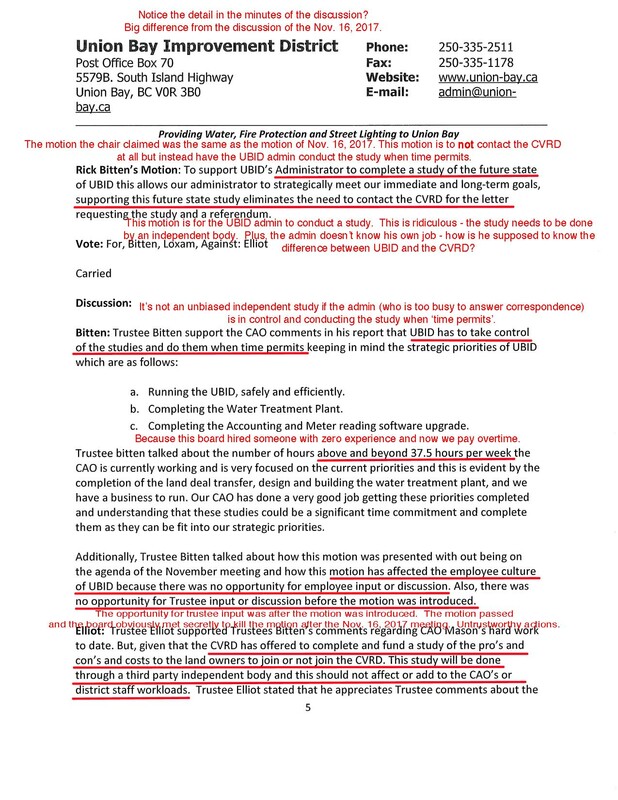 No one should believe the current board is ever going to contact the CVRD to conduct a study at no expense or loss of manpower to the Improvement District. The following is the motion from the Nov. 16, 2017, which passed. You will note the admin neglected to record any of the 17 minutes of discussion which took place. 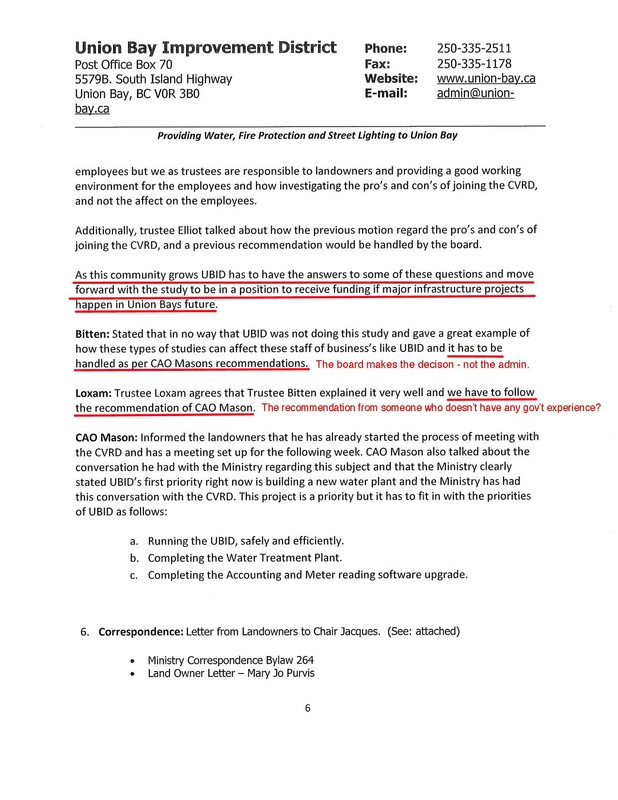 We knew something was up when at the Dec. 2017 meeting we learned the board had made a decision at the COW meeting the prior day about the motion to send the letter to the CVRD. The Chair insisted they couldn’t discuss it because it wasn’t on the agenda. Trustee Elliott reminded the Chair that the board could only bring recomendations from COW meetings. 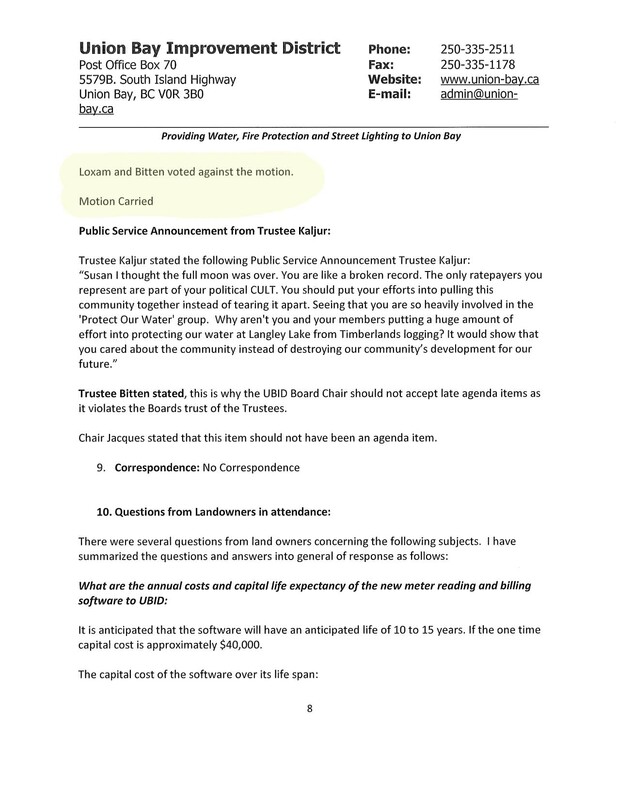 Then at the January 2018 meeting it was obvious some of the board and admin had met secretly to kill the motion passed at the Nov. 16, 2017 meeting. Now instead of an independent study at no cost we are being told the UBID admin will conduct the study in order to have control over it and it will also be done when time permits. In other words – never. 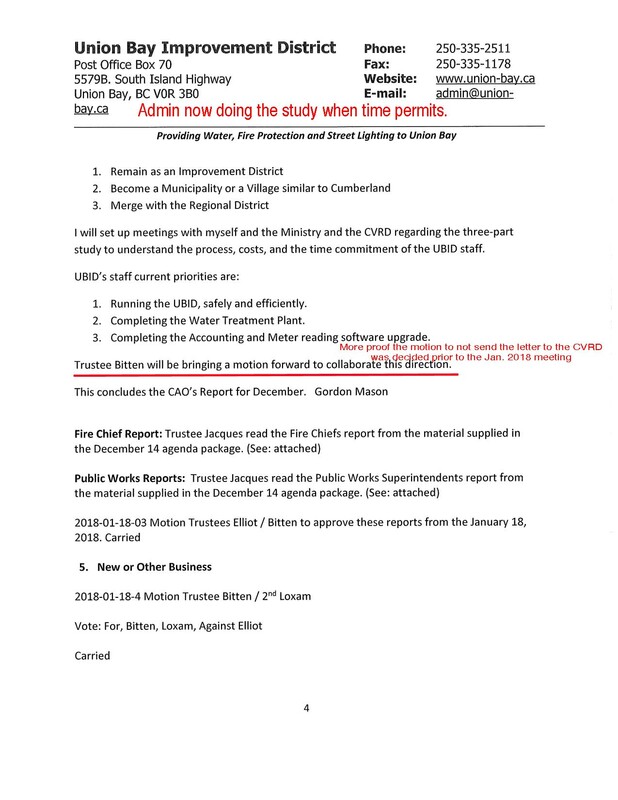 The motion clearly states there will be no letter to the CVRD. Previous Post Summary of All Candidates Meeting for UBID Trustee positions. 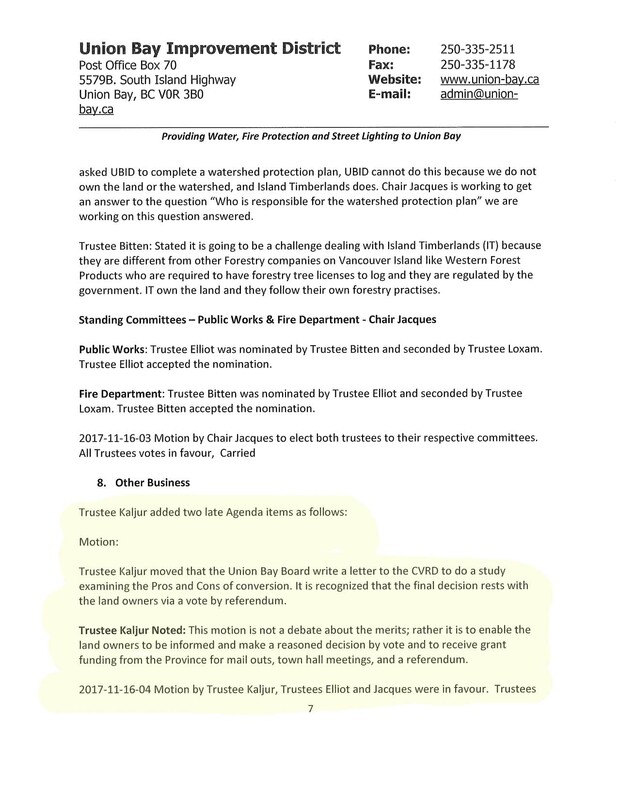 Next Post Kensington Island Properties spokesperson, David Godfrey rears his misleading head again – the chief divider in Union Bay.